M&S Bank- Viva La Evolution! I recently ran a Financial Services Marketing workshop at the CIM Northern Conference, entitled “Viva La Evolution”, where I urged FS Marketers to evolve the way they gather and use knowledge to think about their customers, their market and themselves. One of the tasks I set the delegates was to look at the risk of new market entrants from firms in highly trusted sectors and that had excellent customer service. Marks & Spencer was one of the companies I used in this scenario planning exercise to demonstrate the need to ‘look for competitive threats in unusual places’ and to ‘regularly review and update market response plans’. So Friday’s news that Marks & Spencer is to launch M&S Bank in the summer came as no great surprise to me, with the intention to offer a current account from the autumn and mortgages ‘at a later date’. With over 3 million customers already using M&S Money, the near immediate cross-sales potential of the current account is massive. Add in the fact that M&S has 21 million customers and the business case writes itself. What did surprise me was the rebrand from M&S Money to M&S Bank. The word ‘bank’ has developed negative connotations in some quarters and the move shows clear confidence that the strength of both the M&S brand and the M&S Bank proposition is materially different (and better) to that offered by ‘traditional’ banks. It certainly looks compelling, as customers will have access to branches that are ‘open twice as long as high street banks, seven days a week’, and will have 24 hour access to online banking. This is all made possible thanks to a joint venture with HSBC, who describe this as “our most significant innovation in retail banking since we launched First Direct”. Nothing to be worried about there, then. What do you think about M&S’ move? Do the high street banks have anything to worry about? Or will customer apathy and a renewed focus on increasing customer service levels be enough to hold onto their customer base? Here’s the slide deck from my workshop last month. This entry was posted in Customer Service, Marketing and tagged #CIMNC, bank, CIM Northern Conference, competition, Financial services, Financial Services Marketing, M&S Bank, Market insight, Marks & Spencer, new market entrant, Viva La Evolution on June 10, 2012 by Steve Revill. In previous posts on the theme of ‘giving marketing a rebrand’, I have suggested a number of steps marketers can take to raise their profile, credibility and effectiveness. I have called for them to Fight the Fluff and Manage the Magpie. In this third and final post in the series, I feel it’s time to Trash the Tower. 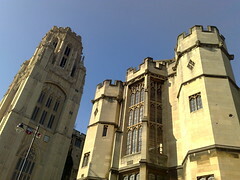 Marketers are sometimes perceived by other functions as living in an Ivory Tower which, according to Wikipedia, is a place “where intellectuals engage in pursuits that are disconnected from the practical concerns of everyday life”. Sometimes we are worthy of the ‘ivory tower’ perception because we have become internally focused and disconnected from the customer. Sometimes workload and organisational politics conspire to make it harder than it should be to spend more time with front line staff and customers, but how else will we get to hear firsthand accounts of how the products and services we are marketing solve (or cause) customer problems? Does this sound familiar? If so, when was the last time you were able to escape the confines of the head office ivory tower and hear the customer’s voice at firsthand? And I mean truly firsthand, not sitting through a 72 slide debrief on ‘wave 58’ of the latest customer satisfaction survey (showing a 3% improvement from ‘wave 57’ but with a +/- 5% margin of error!). How do you gain actionable insights in your team? What are your best practice tips for getting out of the ivory tower and listening to the customer? Where have you seen innovative techniques employed that you wouldn’t expect to see being led by a marketing team? This entry was posted in Customer Service, Marketing and tagged 'B2B Marketing', 'Steve Revill', Business, Customer, customer satisfaction survey, customer service, giving marketing a rebrand, Ivory Tower, marketing, rebrand on March 24, 2012 by Steve Revill. Guess what happened to your email data? too much jargon: what exactly do they mean by ‘breach’ and ‘compromised’? Tell me what happened to my data! What a difference a day makes, 24 little hours…but it leaves me asking the question, ‘Why couldn’t you tell me this yesterday?’. In any form of crisis communication, it’s vital to get all of the known facts out up front, immediately after the apology. Holding back some important facts for 24 hours just fills me with suspicion. This past weekend we discovered that an unauthorised third party had stolen part of TripAdvisor’s member email list. We’ve confirmed the source of the vulnerability and shut it down. We’re taking this incident very seriously and are actively pursuing the matter with law enforcement. How will this affect you? In many cases, it won’t. Only a portion of all member email addresses were taken, and all member passwords remain secure. You may receive some unsolicited emails (spam) as a result of this incident. The reason we are going directly to you with this news is that we think it’s the right thing to do. As a TripAdvisor member, I would want to know. Unfortunately, this sort of data theft is becoming more common across many industries, and we take it extremely seriously. I’d also like to reassure you that TripAdvisor does not collect members’ credit card or financial information, and we never sell or rent our member list. We will continue to take all appropriate measures to keep your personal information secure at TripAdvisor. I sincerely apologise for this incident and appreciate your membership in our travel community. They provided the facts, in plain English, up front. An email list had been stolen. Not a ‘breach’ nor ‘compromise’ in sight. Congratulations TripAdvisor. They have demonstrated that it is still possible to deliver bad news in a positive, professional and reassuring way, without keeping me guessing. I hope play.com take heed. This entry was posted in Customer Service, Data security, Digital Marketing and tagged 'Steve Revill', crisis communication, customer service, Email address, Play.com, Security, Silverpop, TripAdvisor on March 28, 2011 by Steve Revill. Well, following my last post I’m pleased to say that NatWest came good. I confess I adopted a ‘belt and braces’ approach and sent a letter to my branch with a copy of my blog post attached (old school). Now maybe the snail mail chain will catch up and enlighten me as to who/how/when this was picked up but at least the issue is now resolved. This entry was posted in Customer Service and tagged 'social media', 'Steve Revill', bad service, bank, banks, complaints, customer service, natwest, natwest bank, postaweek2011, service, snail mail on February 2, 2011 by Steve Revill. Do Customer Charters drive great Customer Service? I’ve been a NatWest customer for many years and, until recently, have been very happy with the service they gave me. • Customer contacts bank on 31st December. Is told refund will be in account by 12th January 2011. • Nothing happens. Customer calls Bank and is told that Bank has escalated it to their Card Services team, but they will ‘monitor daily’, whatever that means. Now I know that this isn’t exactly headline-grabbing stuff here. Most people reading this will have their own (and probably far worse) version of this chain of events. Having spent the last ten years working in banks, I have seen first hand how internal systems and broken processes can sometimes stop the good people in branches and service centres from delivering great service. So, I turned to the NatWest Customer Charter (http://tinyurl.com/6a2anbz) to find out more about their mission to become “Britain’s most helpful bank”. 1) Give your people the tools and systems to break down internal barriers to great customer service. In my experience with Veolia Water, every single person I spoke to had a record of my previous conversation and actions arising. I have spoken to three different people in NatWest and still my problem isn’t resolved. 2) Empower local office and call centre staff to resolve complaints at the first point of call. Whether NatWest Card Services or NatWest Bank gives me back my £48 isn’t that important to me. Sort it out, refund me and do the internal paperwork afterwards. I’m not sure if NatWest will reach its goal to become “Britain’s most Helpful Bank”, or how it’ll even know if it does. I just hope that someone, somewhere really is listening. This entry was posted in Customer Service and tagged 'Steve Revill', bad service, bank, banks, complaints, Customer Charter, customer service, marketing, natwest, natwest bank, postaweek2011, Veolia Water on January 30, 2011 by Steve Revill.